The insights presented here are from a research study on Foliar Fertilizer Market by Fact.MR. Foliar fertilizers are steadily gaining ground in the agriculture industry as an effective multifaceted solution to enhance plant vitals. Increasing importance of crop nutrition, backed by the rising government initiatives continues to influence the demand for foliar fertilizers. Sales of foliar fertilizers are expected to increase on the back of the increasing demand for agricultural produce worldwide. These insights are according to a new study on foliar fertilizer market by Fact.MR. According to the research, demand for foliar fertilizer is projected to expand at a CAGR of 4% with respect to volume during the period of forecast, 2018-2028. Steady demand for foliar fertilizer is likely to translate into significant sales volumes crossing 3,400,000 metric tons by the end of 2028. Effective training programs provided by the governments regarding the use of foliar fertilizer continues to remain instrumental in driving the foliar fertilizer sales worldwide. Moreover, subsidy provisions by governments in fertilizer space has translated into increased farmer confidence in using the foliar fertilizer, says the study. For instance, the government of India has declared a subsidy of around US$ 10,000 Mn in 2018 encouraging the farmers to improve the agricultural yield. Rising awareness regarding benefits of foliar fertilizer is expected to contribute to the growing sales volumes of the product in the coming years. 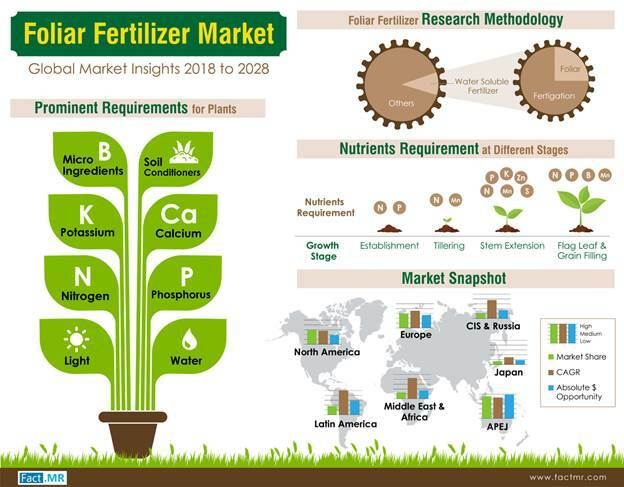 Foliar fertilizer sales with nitrogen composition are likely to be on an upswing on the back of the growing demand for the nutrient in crop rejuvenation. Nitrogen, a key element in crop health, facilitates efficient photosynthesis, protein production, and overall plant physiology. Fact.MR report opines that sales volume of foliar fertilizer with nitrogen composition is estimated to cross 1,800,000 metric tons by 2019 end. On the contrary, the demand for potassium foliar fertilizer is projected to grow at a relatively rapid pace in the light of high pest and disease resistance and fruit quality enhancing properties. Potassium foliar fertilizer also facilitates rapid formation and movement of sugars, starches, and oils in crops, in turn, enhancing the plant nutrition. Sales of mineral foliar fertilizer are expected to gain increasing momentum across key regional markets. Mineral foliar fertilizer is expected to account for a major share in the overall foliar fertilizer market as compared to the organic foliar fertilizer. However, organic foliar fertilizer is expected to gain traction on the back of larger profit margins that they offer. Against this backdrop, manufacturers and suppliers of organic foliar fertilizer are introducing new products. For instance, Gronn Gjodsel AS has introduced Pepton 85/16, an organic foliar fertilizer featuring high nutritional content. Sales of foliar fertilizer are likely to remain concentrated in the Asia Pacific excluding Japan (APEJ) region, particularly in the emerging economies of China and India. The APEJ region’s growing agriculture industry coupled with the increasing population rates are expected to create avenues for foliar fertilizer manufacturers, according to the report. In addition, the demand for foliar fertilizer in Latin America, particularly in Brazil, Mexico, and Argentina, is projected to expand at a robust rate throughout the forecast period. Although nutritional benefits, the foliar burn is expected to challenge the growth of the foliar fertilizer market. Foliar fertilizer feeding permits the nutrients to enter the vascular system of the plant through the direct stem and lead absorption. However, improper foliar fertilizer application can be detrimental to the plant’s health. In bright sunlight, application of foliar fertilizer can result in foliar burns owing to liquid deposition on the leaf, resulting in heat amplification. This aspect is likely to dent farmers’ confidence about foliar fertilizer and impact the sales.